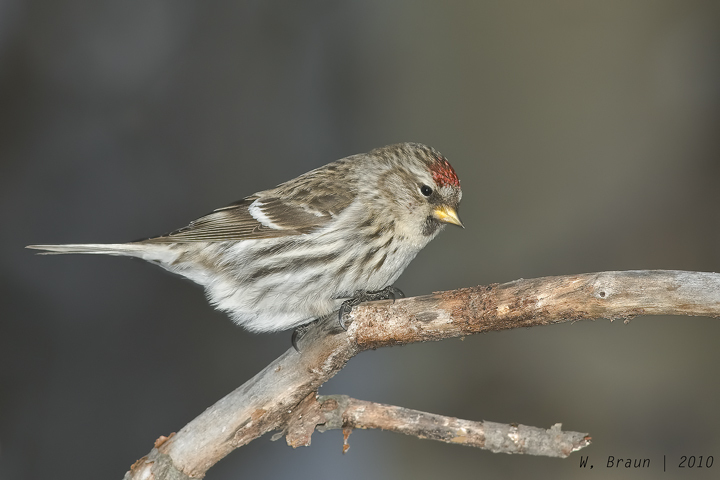 Yesterday a single female Common Redpoll was busily flitting about among the Chickadees at the Hawrelak Park bird feeders. I have seen them in flocks of 10-50 this winter, usually high up on birch stands, foraging on the birch seeds. They come to my own feeders occasionally. This little finch breeds in the open subarctic areas of largely coniferous forest and scrub; it nests on tundra and above timberline where shrubby deciduous and sometimes coniferous vegetation occurs in hollows and sheltered places. It feeds on small seeds and other plant material throughout the year. In the winter it wanders southward in search of food. It is one of our most delightful winter finches.